The first five award-winning Jeri Howard murder mysteries are now available. 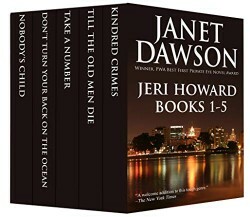 Tough-as-nails Oakland PI Jeri Howard made a splash in Janet Dawson’s first book, winning Best First PI Novel from the Private Eye Writers of America. The next four mysteries only get more enticing!